Crockpot Blueberry BBQ Meatballs are made with ground pork and beef that’s flavored with shallots and goat cheese; then cooked with blueberry barbecue sauce in the slow cooker! Whether or not you’re using the slow cooker I think it can be hard to decide to cook at this time of year. In Utah the May weather can be hot and sunny one day and then raining or even snowing a few days later. What you need for May are things that would taste good no matter what the weather was doing, and I think these Crockpot Blueberry BBQ Meatballs from Slow Cooker Gourmet fit the bill for that. These from-scratch meatballs have panko breadcrumbs soaked in milk, ground pork, ground beef, goat cheese, shallots, and BBQ seasoning. The meatballs are lightly browned for a few minutes under the broiler; then they go in the slow cooker with half the blueberry barbecue sauce and cook for a few hours. When they’re done, meatballs get tossed with the remaining sauce and dinner is ready! And I bet these meatballs are a main dish the whole family will enjoy. 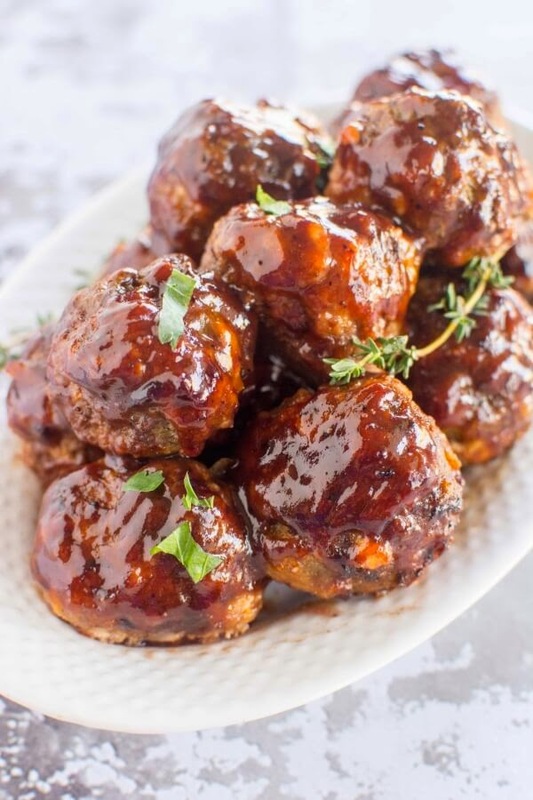 Get the complete recipe for Crockpot Blueberry BBQ Meatballs from Slow Cooker Gourmet. Click here to see all the slow cooker or pressure cooker Sausage and Meatballs Recipes! Blueberry! So interesting; I never would have thought of it with meatballs. Lydia, I thought that too, but what really hooked me was the goat cheese in the meatball mixture.